Where is the color? 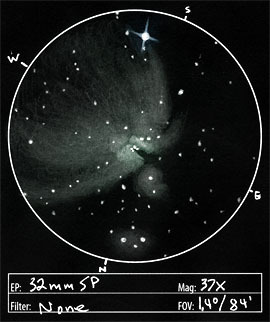 A common question that gets asked among star party visitors and those first-time telescope buyers when they get a glimpse of galaxies and nebula through a telescope. 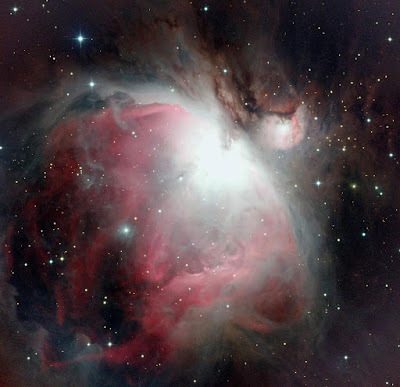 We have been primed through the media - be it web, television, or print - to expect these nebulae and galaxies we observe through our telescopes to have the multicolored palette and hues that we see from images taken with photographic or modern CCD technology. Yet when we step up to the eyepiece to view the Orion Nebula or Whirlpool Galaxy, we see only a grayish blue image through the telescope. So what happened? Sketch by Jeremy Perez, Flagstaff, AZ. It boils down to biology, in particular how your eye works. Your eye has a light-sensitive area called the retina which is composed of two types of light-detecting cells called rods and cones. The difference..? Cones, located near the center of the eye, are capable of detecting color when there is plenty of light available. 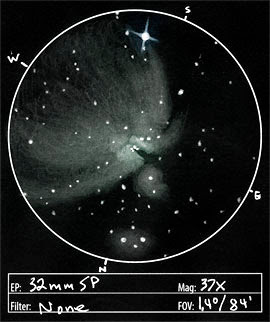 They are not so good, however, at detecting low light levels such as through a typical amateur telescope. Rods, on the other hand, are much more sensitive to low light levels. They do not, however, detect color and are located mostly away from the center of the retina - this is why you can often detect more detail when viewing an object through a telescope by using "adverted vision", effectively looking not directly at the object but slightly off center so that you bring your rods into play. Mike Petrasko & Muir Evenden - Insight Observatory. So there you have it: because of the low light levels present in most astronomical objects viewed through a telescope, the cones of your eye are unable to detect the object, whereas the rods are able to perform this task, but without any color information. When there is enough light available, such as when we view a planet like Jupiter or Mars through the telescope, then cones can come into play and we see the same color as comes from NASA space probes. Note that photographic or electronic (CCD) detectors don't have this cone/rod problem, but in order to improve their sensitivity to low light, a combination of low temperature and long exposures must be used to record the light from the object and present it to us in the form of an image.